Put your trust in our trained and experienced laundry specialist to provide you with exceptional service and incredibly fast turnaround times. Count on us for excellent results. Need your work shirts cleaned and pressed but don’t have time to come in? Take advantage of our FREE regular home pick-up and delivery service. You’ll get terrific care from us. 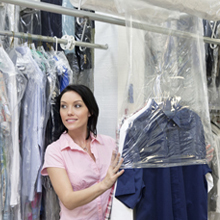 As we have been named Best Dry Cleaner of Manchester by the Manchester Award Program, you can be certain that we will provide you with dependable laundry services.